2019 marks 10 years of the existence of the Eastern Partnership initiative, a policy that aims to deepen and strengthen relations between the European Union, its member states and its six Eastern neighbours: Armenia, Azerbaijan, Belarus, Georgia, Moldova and Ukraine. Within this policy, there is a joint commitment of the EU, EU member states and the six EaP countries to deliver tangible changes for citizens across the region. 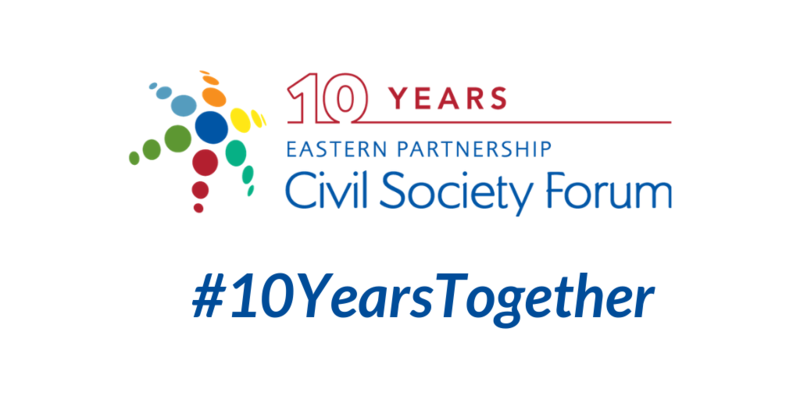 In this context, the aim of #10YearsTogether campaign is to reflect on the development of the six EaP countries in the past 10 years. A special attention is dedicated to the assessment of the current approach based on 20 Deliverables for 2020. Moreover, together with our members, national and international partners and EaP policy decision makers, this campaign aims to outline possible trends for the future policy towards the region beyond 2020. We kindly invite you to scroll through our campaign activities outlined on this page. Also follow our activities on Social Media via #10YearsTogether! The annual meetings of the EaP CSF Working Groups in the spring of 2019 are serving as a springboard for four public events in Brussels, focusing on different policy areas of the EaP initiative. The major achievements delivered thanks to the EaP policy in the partner countries will be discussed from the perspective of civil society, identifying trends and strategies developed for ensuring sustained progress of reforms beyond 2020. On the course of EaP policy implementation, civil society in the partner countries has become an indispensable counterpart to the EU institutions, member states and several EaP governments. The level of dialogue among the national stakeholders, EU institutions and civil society and involvement of civil society into the policy-making has been growing. The civil society acted as a guardian of democratic principles, transparency and adherence to human rights facing various levels of risks. How can we collectively ensure that the reforms are going on with a good pace? What can we learn from the successes and failures of 10 years of EaP policy implementation? What are the critical points that should guide the development of the policy beyond 2020? How the marginalisation of the EaP policy can be prevented? Find out more for yourself below, and browse through the pictures from the events that already took place. Read more about EaP CSF Brussels Public Event Series – click here to access individual event pages, for full programme and discussed agenda.